Our event was born of a desire to meet other like-minded sports boat enthusiasts, cruise with the added confidence of other boats and to share some of the diverse and exciting waters in the South West. ​We average about 20 boats a year, but have had as many as 25, and while we focus on the fun and social aspect, we also offer cruises, pub raffle, BBQ etc., see further below for more on all the other great aspects our rally offers. So whether you are a seasoned boater looking to join a great group, or more of a novice with your first boat, we offer a wealth of knowledge and immense fun for all. The Brixham events pontoon is already booked from the 25th May through until 10am on the 27th. We will no doubt have the early arrivals get together on the 24th. The organisers will be getting together late 2018 to have a team briefing and put the plans together for next years event and create the schedule, between now and then if any of you have any thoughts or ideas you would like us to introduce into the 2019 schedule then please do drop me an email to anthony.baddeley@yahoo.co.uk so that I can include in the briefing notes. Following on from feed back during the rally and since on various mini meets we are going to change the registration fees slightly. The reasons behind this are inflation, your lovely prizes you all win each year get more and more expensive and the volume appears to be dropping so here is what we are going to do. 2019 REGISTRATION IS OPEN fee £30 per boat for a weekend of fun and laughter on the water. The payment methods will be as before once registered we will send you an email with the payment details and once we have confirmed payment your slot is secure. As before if for any reason you need to drop out following registration we will refund your monies once your place has been filled. The reason for this is the budget forecast for the prizes and we order in advance. As per 2018 due to the size of the pontoon we are limiting numbers to 30 boats so first come first served folks. Think thats about it for now everyone but be ready for November the 1st, I look forward to requests or ideas in due course. Join our facebook group 'South West Sportsboat Group' for more info, discussions, help and support, banter and other mini-meets. See below for more info on what our event offers. ​Our rally aims to offer everyone something they'll enjoy. We have a fantastic bunch of regulars with new friends joining us every year, we are very family friendly, have a great social scene and enjoy getting together and talking about our boats, chilling out and cruising in company, we even rent a pontoon so you have somewhere to berth. We create a schedule for the event, but are very relaxed about what you do. If you feel a trip is too far, you can choose to go off and do your own thing or just hang out on the pontoon with the comfort of knowing when we'll arrive back. Check out our 2019 Event page for updated info as it evolves. We do try and make sure we cover all the bases, but equally encourage feedback and ideas on how to improve things. We consider this event as a cooperative and love people to get involved, so if you have a specific skill or expertise and you want to share this, please let us know. Over the years now, we've had a great range of boats coming to our rally - but we want more. 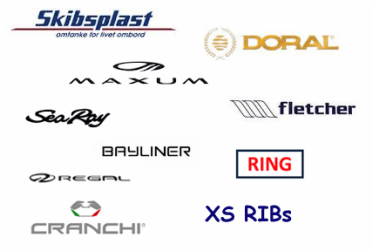 Fletcher, SeaRay, Maxum, Doral, Ring, XS Pro, Skipsplast, Bayliner, Regal, Rinker & Cranchi.